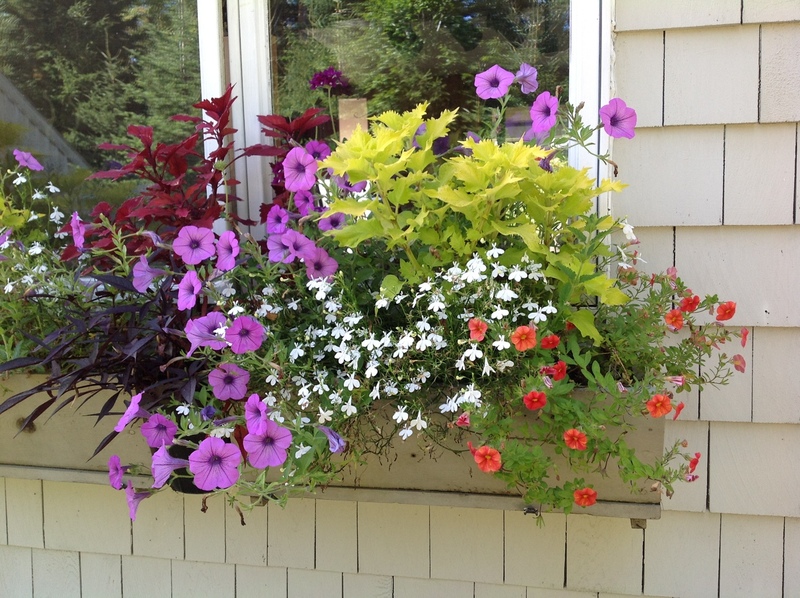 This colorful window box faces east and receives a lot of morning light. 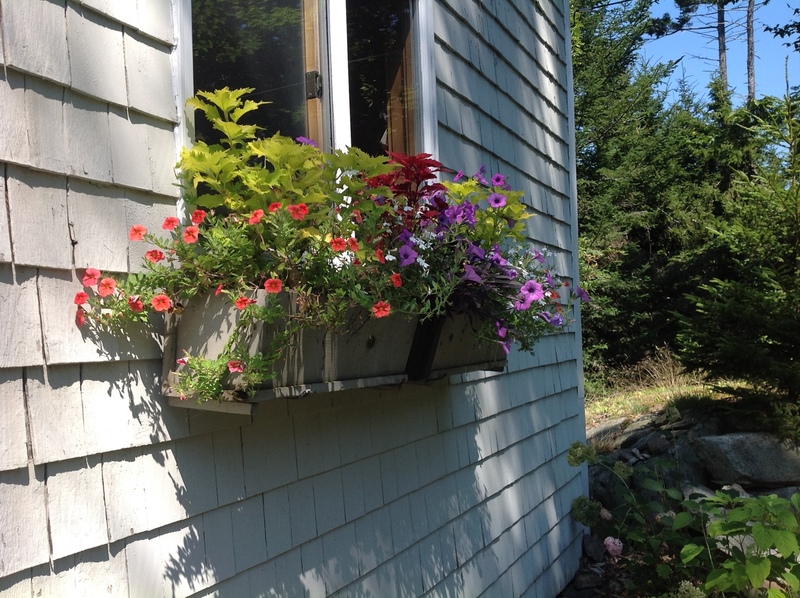 Last August I wrote a post about the annual containers at my family’s home in Maine (click on the link to read it). It turned out to be one of my most popular posts so I thought I would show you the 2012 containers. As I have mentioned before, this is the only gardening that I do around the house because I want to keep the beautiful native plant habitat in tact. I recently removed the existing perennial garden and replaced it with native hydrangeas (click here to read about that project). The containers consist of a set of window boxes and a large terra cotta pot by the front door. As you can see in the first of the two photos above, the window boxes are over the new hydrangea bed on the front or street side of the house. The location faces east and receives morning sun—it is not full shade. 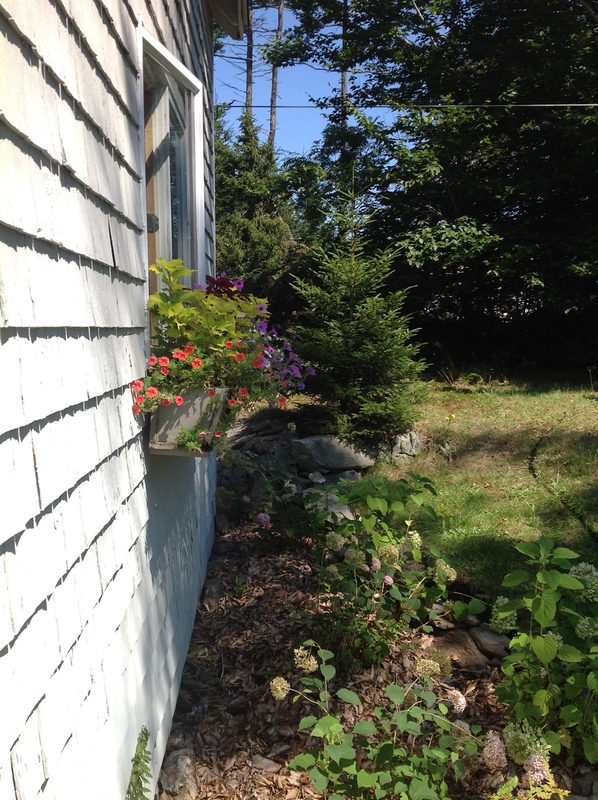 The second photo shows that the window boxes are directly below what is my kitchen window, which means that the plants have to be lower, no more than 12 to 18 inches. In container parlance that means fillers and spillers but no tall thrillers. The plants are viewed even more from inside so they have to look good from both sides. I like the crammed look for containers so mine always have lots of plants in them. Spilling out the sides of the two boxes are ‘Callie Orange’ million bells while white annual lobelia and ‘Midnight Lace’ sweet potato vine cascade out the middle. The fillers, which I also find thrilling, are the lime green coleus ‘Wasabi’ and the purple coleus ‘Spitfire’, two shorter varieties. Filling in between the coleus and the spillers are a medium purple petunia and a very dark purple verbena. Although the verbena is not visible in the photo because it was taking a break, it so beautiful that it is worth putting up with its intermittent bloom. The above two photos are of the large container by the front door also facing east and getting morning sun, although a little less because of the rhododendron. 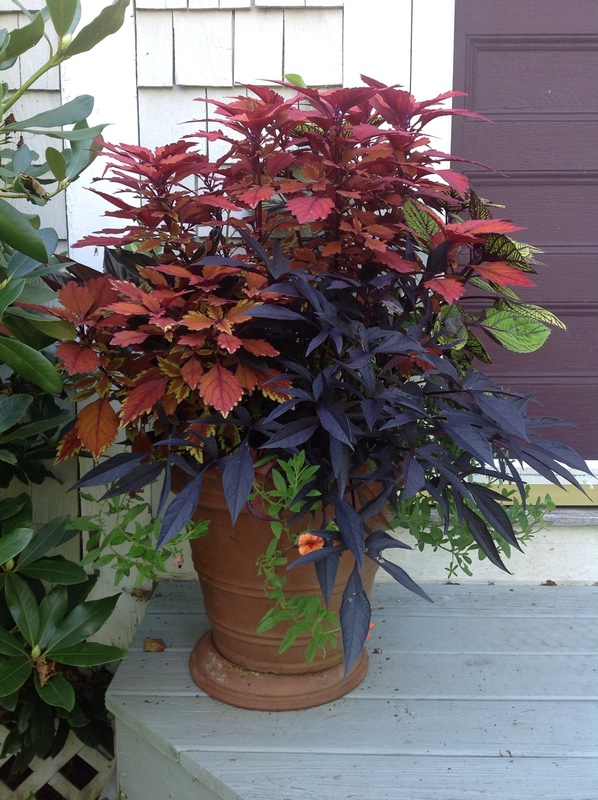 I usually use a color scheme in this container to compliment the eggplant-colored front door, and my go to plant for height is often purple fountain grass (see last year). This year I decided to use variegated shell ginger, Alpinia zerumbet ‘Variegata’, which I got as a member dividend from the Scott Arboretum. It has two foot long, feather like, yellow-streaked leaves and reaches six to eight feet. Unfortunately, though very healthy, it refused to grow higher than a foot and is plugging along happily behind the coleus. So no tall thriller here either! A close up of my new favorite coleus, the lovely and cleverly named ‘Fishnet Stockings’. This beautiful coleus called ‘Sedona’ does have the gorgeous orange red color of the Sedona area, but the iPad camera refused to capture it no matter what time of day, light conditions, or angle I chose. I try to have the window boxes and the large pot echo each other so I use some of the same or similar plants. This larger container has a frilly underskirt of ‘Callie Orange’ million bells with a froth of ‘Midnight Lace’ sweet potato vine above it. 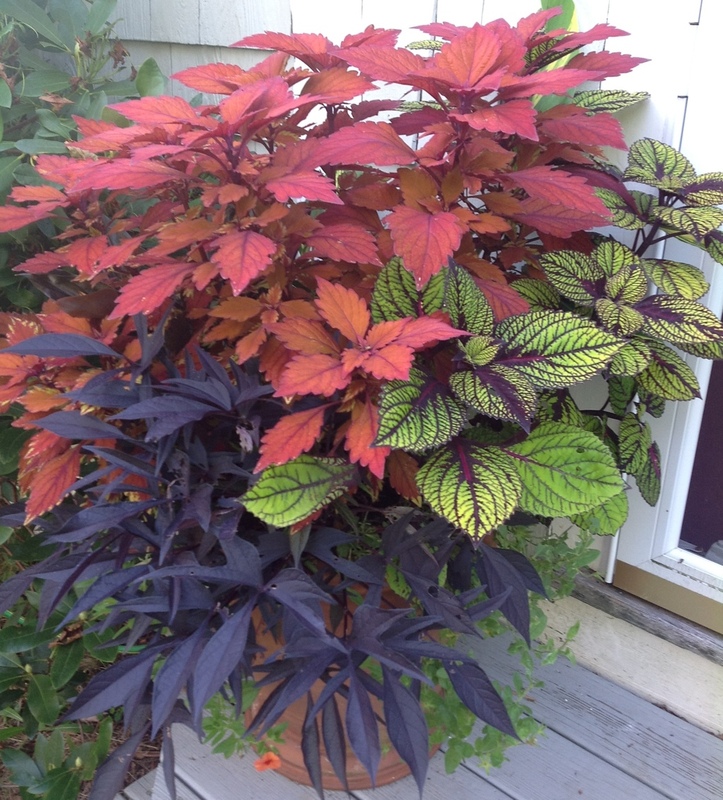 I could choose taller coleus for this container so I used the intriguing ‘Fishnet Stockings’ and the colorful ‘Sedona’. Perhaps I have given you some ideas for your own container plantings in 2013. I am sure some of these plants would work in shadier sites, but I am hesitant to recommend a plant for a condition in which I have not tried it. Nursery Happenings: The nursery is closed until the fall and should be opening soon. If you are on my customer list, look for an email. Thanks for a great spring season! This entry was posted on August 31, 2012 at 12:21 pm and is filed under Uncategorized with tags Alpinia zerumbet 'Variegata', annuals for shade, coleus 'Fishnet Stockings', coleus 'Sedona', containers for shade, shade annuals, variegated shell ginger. You can follow any responses to this entry through the RSS 2.0 feed. You can leave a response, or trackback from your own site. Fishnet stockings is fantastic! Thanks for sharing – your photos are exquisite! I took the photos with my iPad and am viewing the post on it so it is nice to know that the photos look good on people’s computers. Hi Carolyn – the containers are stunning, I might try some of your mixes here. I love the colours you’ve used and contrasting foliage really looks great! The planters really filled out, Carolyn. They look beautiful. I love that container planting by the front door. I just love the use of orange with purple! 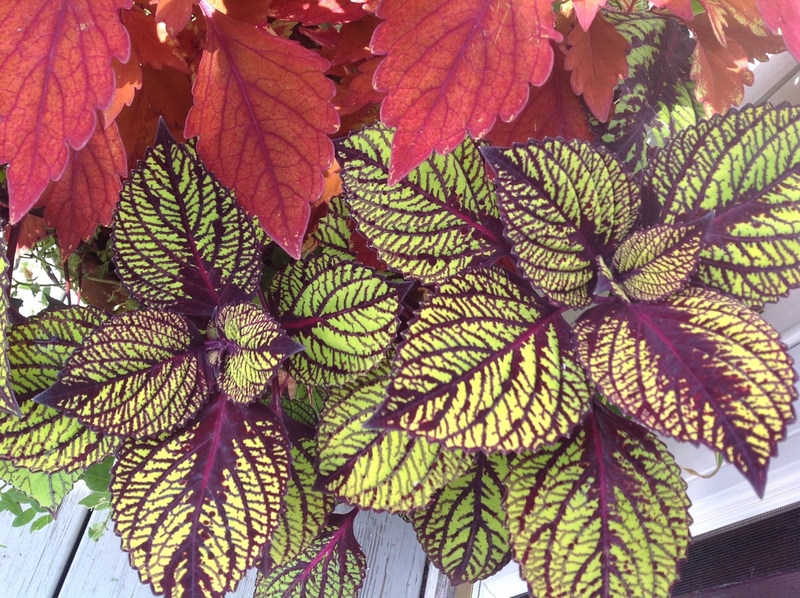 And the “fishnet stockings” coleus is the perfect addition – and what a fun name! I will have window boxes on my shed next year. They still need painted as well as the shutters…..it got too hot to paint. Anyhow, thinking the side of the shed was the northern side, that it would be shady turned out not to be exactly true. 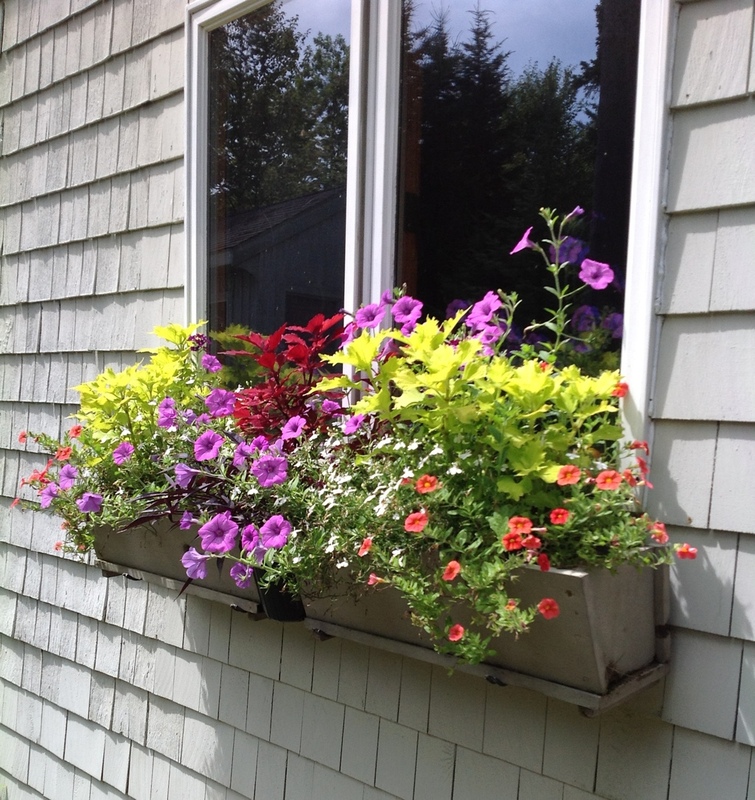 Glad I had this summer to watch the sun for these window boxes…I also won’t have thrillers, just fillers and spillers. Love those coleus! Lovely combinations and textures, will certainly bear some of these in mind next time for my large pot by the front door which is in shade all day. You’ve got several of my favorites there including Sedona coleus which thrives in full sun here in Seattle as well as part sun. Actually I think ‘Spitfire’ is even better – and similar colors. I have become fond of the ornamental pepper plants for my teal-colored patio pots. They have interest all summer and the variegated ones are particularly nice. Carolyn I was excited to see this post as I remember last year’s. I rarely use coleus and do not know why…I need to try some next year! 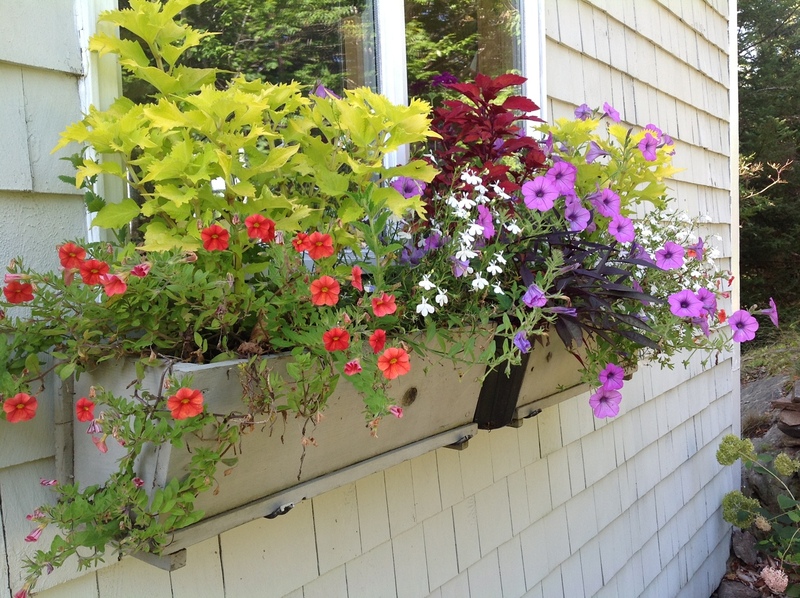 Lovely window boxes and containers Carolyn. Like many others I am also very taken with the Coleus Fishnet stockings. The window at the front of our house is North facing, and I am often surprised as to how well annuals which prefer a sunny position perform, I think the shelter from the house compensates for the lack of sunshine. On your sidebar I see a box which says this is a word verification free site, I wish all blogs were, as it often takes me four attempts to get it right. These are great ideas, Carolyn. I love million bells calibrachoa and order lots of them each spring. They are in so many lovely colors. I like your combinations very much. Oh you always inspire me Carolyn! I’ve avoided coleus for years but I can see how they work in your annual pots, so pretty. Carolyn, I just love the colours of your pot at the front. The dark purple is the perfect foil to the bright oranges and lime greens. It has good height too even if it’s not as tall as you thought it might be. Hi Carolyn, The window box and front door container look wonderful. 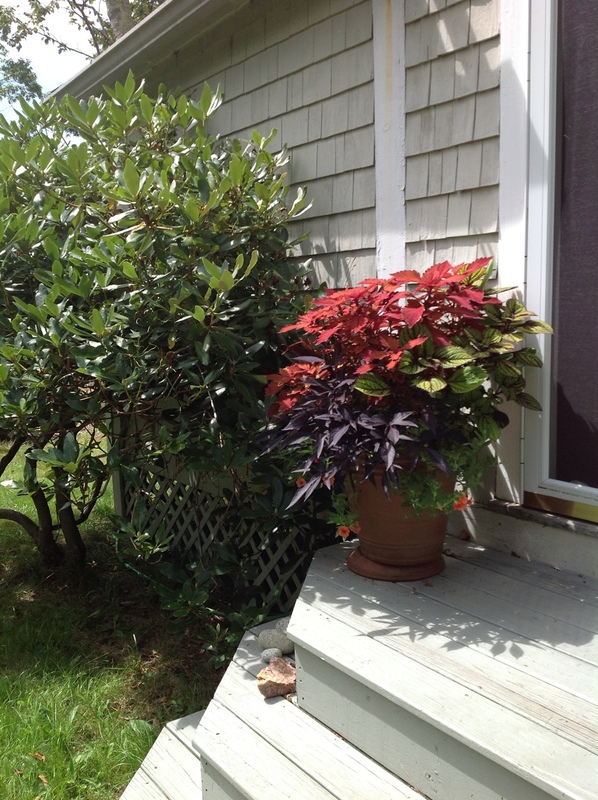 I planted coleus this year both in the garden and in a window box. I found that it got a little large in the window box, but fortunately I put the coleus to the back of the planting. 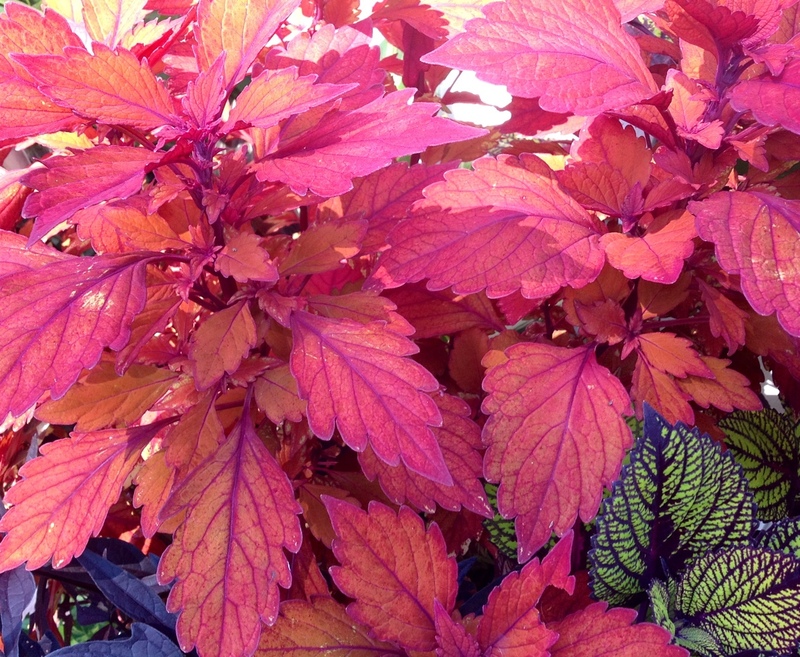 I planted a Wasabi coleus in the garden and it still looks great into September. I will definitely add more coleus to the garden next year. What a nice blog you have here full of fascinating Pictures and articles I find usefull for my own garden.